Singapore had to come from behind twice on Tuesday evening to prevent falling to an embarrassing defeat after a 2-2 draw with Guam at the Jalan Besar Stadium. In what proved to be an impressive start by the visitors, they started the brighter of the two sides and carved out a host of chances in the opening exchanges. Shane Malcolm looked the likeliest source of a Guam goal as he regularly found his way in behind the opposition defence, although he could only fire into the side-netting from a tight angle after rounding Izwan Mahbud in the fifth minute, before having a low shot saved by the Lions keeper four minutes later after skipping past two men. The hosts had an excellent chance to break the deadlock when Baihakki Khaizan made a darting run to the near post to meet Zulfahmi Arifin’s corner and nodded it towards the far post, although Alexander Lee was perfectly positioned to hack the ball to safety. But eight minutes before halftime, Matao opened the scoring after Malcolm held the ball up inside the area before sending a low cross into the six-yard box, where Shawn Nicklaw proceeded to nip in ahead of Izwan and stab the ball home. Nonetheless, the Lions pulled level nine minutes into the second half when Ismadi Mukhtar found space down the right and floated a lovely cross onto the head of Faris Ramli, who made no mistake in planting a firm header past Bijan Gloston. Still, Guam reclaimed the lead in the 73rd minute and it was a strike worthy of winning any contest; Jason Cunliffe latching onto a throw-in and sending a stunning first-time half volley with the outside of his left foot looping over Izwan and into the far corner. However, the hosts did managed to respond once more with ten minutes remaining when a short corner routine eventually saw Shahril make his way to the edge of box and float a dangerous delivery for Baihakki to volley into the back of the net. Singapore did have one final chance to win it in injury-time when Shahril charged through the middle and curled away a shot from the edge of the box, but Gloston produced a brilliant flying save to deny the Lions the victory. Singapore: Izwan Mahbud, Ismadi Mukhtar, Baihakki Khaizan, Zulfahmi Arifin, Shakir Hamzah, Hariss Harun, Safuwan Baharudin, Sahil Suhaimi (Gabriel Quak 46’), Shahril Ishak, Faris Ramli, Khairul Amri (Shahfiq Ghani 73’). Guam: Dallas Jaye (Bijan Gloston 46’), Alexander Lee (Min Choi 90’), Mason Grimes, Brandon McDonald, Nathaniel Lee (Micah Paulino 58’), Ryan Guy, Justin Lee (Dylan Naputi 69’), Shawn Nicklaw, Jason Cunliffe, Shane Malcolm (Jan Staman 85’), John Matkin. Singapore international Hassan Sunny is determined to rise to the challenge of playing overseas after completing his move to Thailand’s Army United. Following a three-day trial earlier this month which has ultimately proved to be successful, Hassan has put pen to paper on a one-year deal with the Thai Premier League outfit and arrived in Bangkok on Sunday to begin his journey as a foreign player plying his trade in what many currently regard as the best league in Southeast Asia. The 30-year-old already made history last year when he became the first goalkeeper to win the S.League’s Player of the Year award, after his consistent displays helped former side Warriors FC claim their first league crown since 2009. Following that success, he was Singapore’s first-choice custodian in their ill-fated 2014 AFF Suzuki Cup title defence, where they were eliminated in the group stages, and was preparing for the upcoming S.League campaign with new side Tampines Rovers. However, the Stags maintained they would not stand in the player’s way should an offer from overseas come his way, and with his move to Army now completed, Hassan is now ready to make the most of what he admits is a ‘dream’ move. “I think most people know that it’s very difficult – or should I say almost impossible – for goalkeepers to get out there and play outside Singapore,” he told Football SEA. “Even more so when you consider it’s a league that has a limit on foreign players. Considering he is arguably one of the region’s top two goalkeepers, along with Muangthong United star Kawin Thamsatchanan, the fact that foreign teams have shown interest in him should come as no surprise. Nonetheless, he admits there will always be reservations over signing a foreign goalkeeper, but is relishing the chance to prove any doubters wrong. “I guess there will always be people who believe a foreign player spot would be wasted on a goalkeeper,” Hassan added. “Initially, even the club were uncertain if they needed a foreign goalkeeper, but everything changed at the end of the day and they decided to sign me. In recent times, several of Singapore’s top players have been courted by foreign sides with Hariss Harun, Shahril Ishak and Baihakki Khaizan all playing for Johor Darul Ta’zim I and II in Malaysia. Still, Hassan can lay claim to being the first local-born Singaporean to earn a move to Thailand, although English-born John Wilkinson did play for Police United in 2011. 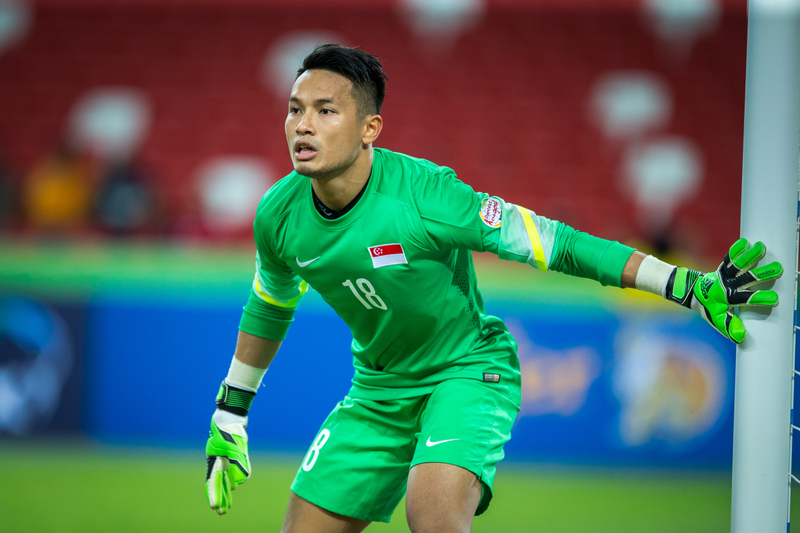 And the former Geylang International and Courts Young Lions man is hoping he can inspire the next generation of footballers in the country – both outfielders and goalkeepers – to dream big. “Hopefully the young ones can learn from this,” he said. “Especially our young goalkeepers. “It’s all about changing the mind-set and believing that nothing is impossible. “All you need to do is have a dream or set a target, and then work in that direction. Hassan is certainly no stranger to hard work given he is renowned for his professionalism and discipline on the training track, and he showed tremendous resilience to bounce back from a wretched run with injuries in 2011 and 2012. Another challenge now awaits him as he embarks on an adventure in a new country with a different lifestyle and culture to Singapore. But displaying his trademark assuredness, Hassan insists it is just something he will have to deal with as a foreign player in Thailand. “To be honest, I believe one has to get out of their comfort zone in order to be successful,” he revealed. “Sometimes you have to struggle and overcome it to achieve something – nothing comes easy. Hassan will be looking to make his Army debut on February 14 when his side open their 2015 Premier League campaign against newly-promoted Siam Navy. Malaysia are through to the semi-finals of the 2014 AFF Suzuki Cup after claiming a 3-1 win over Singapore to finish second in Group B. Following a goalless first half at the National Stadium, Harimau Malaya took the lead in the 61st minute when the ball broke to Safee Sali inside the box, and the striker made no mistake in smashing an emphatic strike into the back of the net. However, Singapore looked to have forced the draw they needed to advance when Khairul Amri pounced on rebound to score, after Safuwan Baharudin’s blistering freekick had been parried by Khairul Fahmi. But as the clock ticked over into injury-time, Malaysia were controversially awarded a penalty after Amri Yahyah was adjuged to have been shoved from behind by Hafiz Abu Sujad; Safiq Rahim stepping up to the spot and firing past Hassan Sunny’s despairing dive. And right at the death, with Hassan up in the other box in a last-ditch attempt to grab an equaliser, the Malaysians cleared their lines and hit on the counter before Indra Putra Mahayuddin slotted into the unguarded net from 30 yards out to seal the win for his side. Next up for Harimau Malaya will be a semi-final clash against Group A winner Vietnam, with the first leg to take place on December 7. Malaysia: Khairul Fahmi, Mahali Jasuli, Shukor Adan, Muslim Ahmad, Zubir Azmi, Azamuddin Akil, Gary Robbat (Hafiz Kamal 58’), Safiq Rahim, Amri Yahyah, Safee Sali (Indra Putra Mahayuddin 88’), Norshahrul Idlan Talaha (Abdul Manaf Mamat 90’). Singapore: Hassan Sunny, Ismadi Mukhtar, Safuwan Baharudin, Shakir Hamzah, Shaiful Esah (Hafiz Abu Sujad 63’), Hariss Harun, Shahril Ishak, Fazrul Nawaz (Gabriel Quak 63’), Shahfiq Ghani (Amirul Adli 76’), Faris Ramli, Khairul Amri. Singapore remain in the running to qualify for the 2014 AFF Suzuki Cup semi-finals after claiming a 4-2 win over Myanmar in Wednesday’s Group B clash at the National Stadium. The Lions took the lead after 16 minutes when Shaiful Esah whipped in a 25-yard freekick that sailed past a sea of players, before taking a bounce and making its way into the bottom corner. Five minutes after the half-hour mark, the hosts doubled their tally when Hariss Harun was picked out by Faris Ramli on the edge of the box and brought the ball under control with his chest, before sending a stunning volley past Thiha Sithu. The contest then looked all but over when Singapore made it 3-0 two minutes before halftime as Hariss lashed another volley – this time on his left foot – into the back of the net, after Myanmar had failed to clear their lines from a corner. However, the White Angels were handed a lifeline in the 56th minute when Kyaw Zayar Win broke free inside the area following a lovely one-two with Min Min Thu, before slotting his shot past Hassan Sunny. Six minutes later, the deficit was reduced further as Kyaw Ko Ko stepped up to the penalty spot and fired straight down the middle, after he had been barged over by Safuwan Baharudin inside the area. Nonetheless, any hopes Myanmar had of pulling off a miraculous comeback were ended 15 minutes from time when Khin Maung Lwin, in an attempt to clear another dangerous freekick by Shaiful, only succeeded in steering the ball past his own goalkeeper to seal the win for the Lions. The victory means Singapore are now up to second place in Group B and a draw against arch-rivals Malaysia would be enough to see them advance to the last four, provided leaders Thailand beat Myanmar. Myanmar: Thiha Sithu, David Htan, Aung Zaw, Win Min Htut, Khin Maung Lwin, Tin Win Aung, Yan Aung Kyaw (Kyi Lin 46’), Kyaw Zayar Win, Min Min Thu (Chit Su Moe 84’), Nanda Lin Kyaw Chit (Nyein Chan Aung 63’), Kyaw Ko Ko. Singapore: Hassan Sunny, Ismadi Mukhtar (Al-Qaasimy Rahman 38’), Baihakki Khaizan, Safuwan Baharudin, Shaiful Esah, Hariss Harun, Shahdan Sulaiman (Zulfahmi Arifin 24’), Sahil Suhaimi (Fazrul Nawaz 77’), Shahril Ishak, Faris Ramli, Khairul Amri.